Lori Page: Reliable, Kind, Friday PM Volunteer! February is about love, and we LOVE our volunteers. 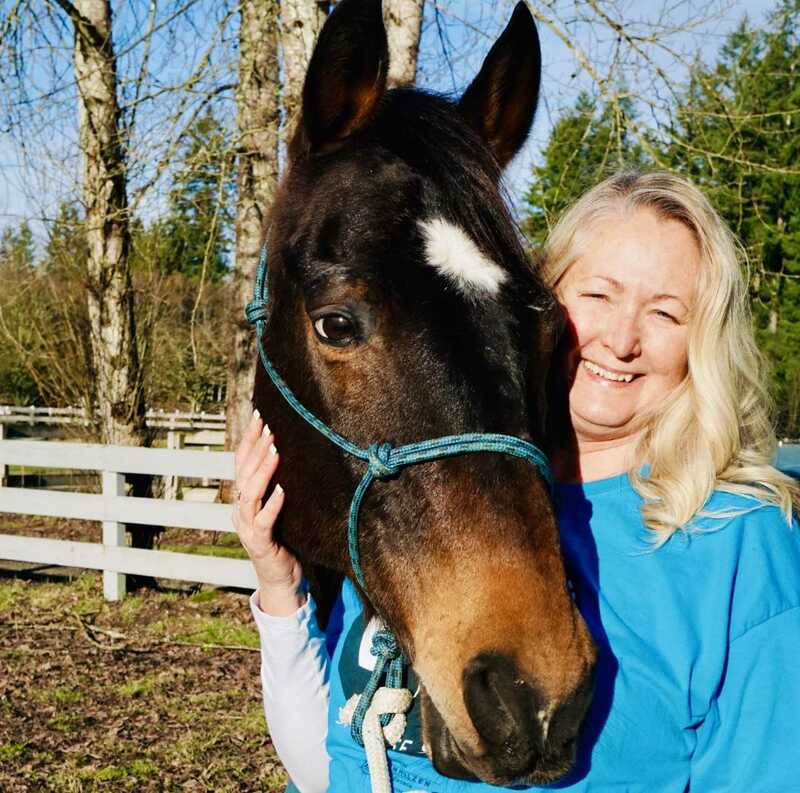 We love that our volunteers love each other, and we really LOVE that our volunteers love the horses. 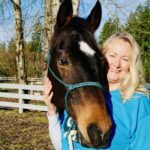 Lori Page is someone who falls into all of those categories, she loves SAFE, she loves her fellow volunteers and she LOVES the horses. Her very first memories are of horses when she was 5 or 6 years old. She was hooked from the very start, and although she doesn’t have a horse right now, she has had many over the years. 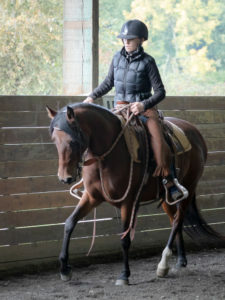 Lori once had a beautiful gelding named Co Co who was a tall, successful jumper. Lori and Co Co had a special relationship. He even let himself into the house on more than one occasion. They walked in the Redmond Derby Days parade together for a number of years. Even though he has been out of her life for some time, Lori still thinks of him and misses him. She has had many favorite SAFE horses over her almost three years with us, but Raven will stay with her forever. Raven held a special place in her heart and she misses her a lot. We have Lori’s sister to thank for Lori finding us. When she learned about SAFE on Facebook, she came right out to an orientation and has been on a chore shift ever since humbly and reliably doing chores no matter the weather. When she isn’t at SAFE enjoying the sights and sounds of the barn, she is spending time with her grandchildren, family, and friends. She enjoys walking her dog, gardening, hiking, and just being outside. Lori, we are grateful for your service and your smiling face. Congratulations on being named a February Volunteer of the Month! 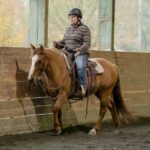 Kaya Mead: Patient, Calm Horsemanship Volunteer! 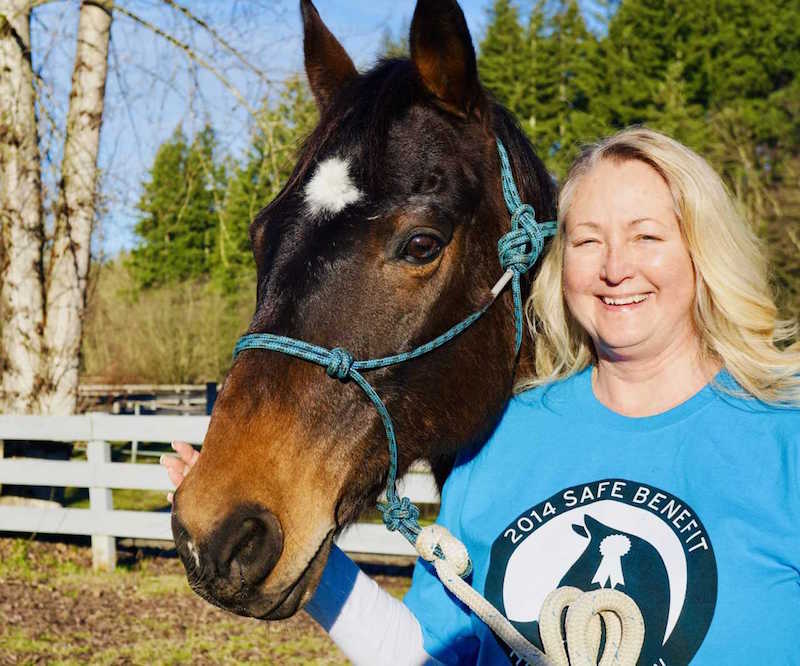 February Volunteer of the Month, Kaya Mead, has made a big impression on SAFE in a small amount of time. 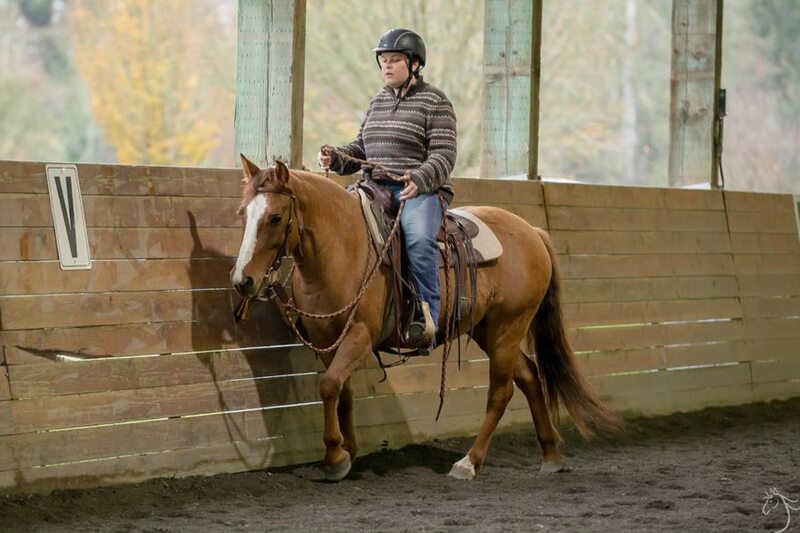 Kaya is part of our horsemanship program and she works with a number of our horses weekly. She really loves them all. 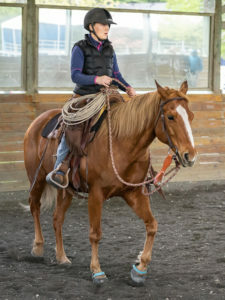 Her stock phrase is, “I just love this horse so much!” She particularly loves Angel and Lacey, two horses that need the patience and consistency Kaya provides. 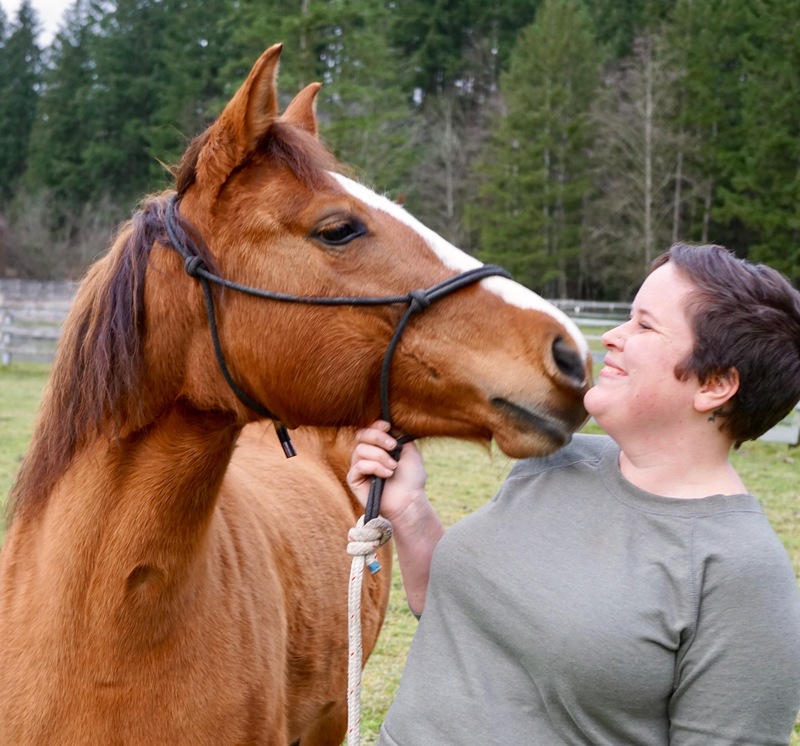 Her early experience with horses left a lasting mark on Kaya. 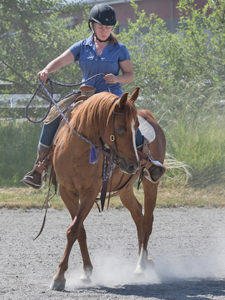 She was fortunate to grow up next door to a professional Arabian horse trainer where Kaya traded mucking for lessons. It was at this barn Kaya met a beautiful dark bay Polish Arab mare named Brandy who clearly had a low opinion of people. Kaya used her calm, kind, patient nature to reassure Brandy. The consistent kindness she showed Brandy made all the difference, and by the end of their acquaintance, Brandy would come for pets and scratches of her own accord. 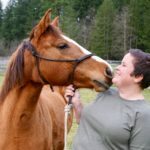 This experience inspired Kaya and lit a flame of desire to help horses to be happy in the world of humans. Kaya was born in West Michigan and moved to South Carolina before settling in Seattle in August of 2017. She found SAFE online and was thrilled to find a place to utilize her skills and meet people who share her passion. Kaya feels so grateful that she found SAFE. She is appreciative for the opportunity to learn and grow with us. When she is not volunteering at SAFE, Kaya is working to help teens facing homelessness gain life and career skills at a nonprofit coffee shop in Seattle. SAFE shares her attitude of gratitude, thank you Kaya, and congratulations on being a February Volunteer of the Month!